Calling all superheroes! Join us for the Strong4Life Superhero Sprint, a 5K and 1 mile "fun run" event on Saturday, June 1. 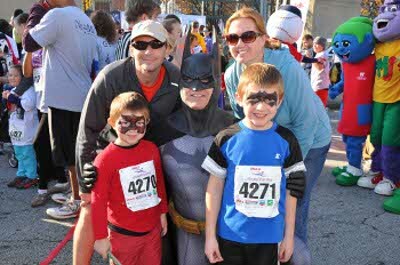 Wear your favorite superhero gear and use your super powers to walk, run or sprint to the finish line. Prizes will be awarded to the adults, children, groups and dogs with the best superhero costumes. This exciting family event at Piedmont Park benefits Strong4Life the Children's Healthcare of Atlanta movement, dedicated to reversing the epidemic of childhood obesity and its associated diseases in Georgia. 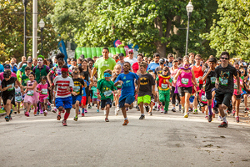 By doing just the 5K on June 1, you can help raise the funds needed for Strong4Life to reach even more families through school and provider training programs, community partnerships and policy change efforts. Online registration for the 2019 Strong4Life Superhero Sprint is now open and will remain open through Thursday, May 30, 2019 at 8:00am EST. You will also be able to register on race day, Saturday, June 1, 2019 down at Piedmont Park between 7:00am and 10:15am for the higher fee of $35.00 per person. We will accept cash, checks and credit cards on race morning. You can also print the race application by looking on the left navigation tool bar and there is a link there to print the order form and mail it in. Please submit with payment no later than Monday May 20, 2019 - the mailing address is on the form. Strollers are welcome and encouraged. You can find information about the location of the event inside Piedmont Park and information about parking as well as other frequently asked questions on our main website www.choa.org/superhero. Thank you for your support of this fundraising event and Children’s Healthcare of Atlanta.